The Beauty Scoop! 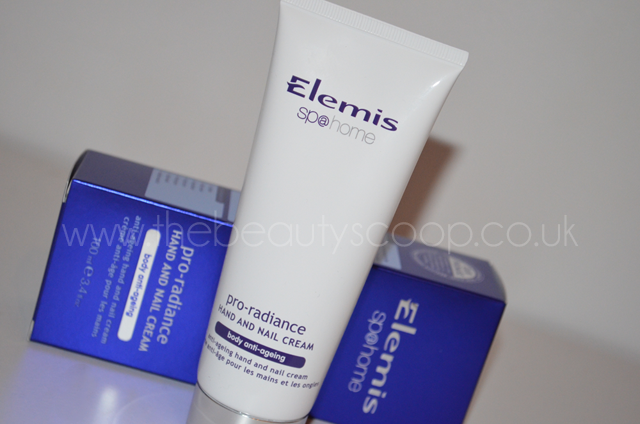 : Elemis Spa @ Home Pro-Radiance Hand & Nail Cream. 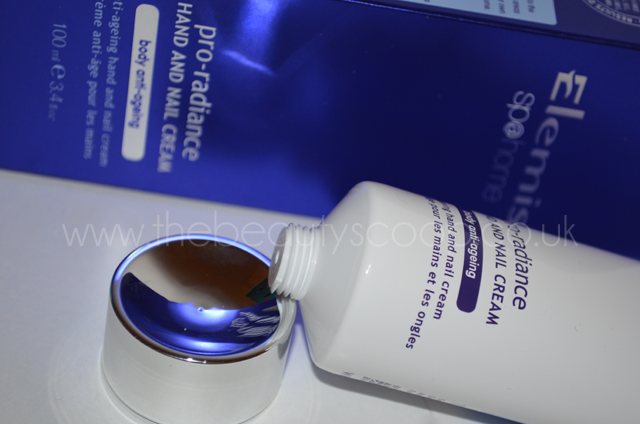 I've had my Pro-Radiance Hand & Nail Cream since it was included in a TSV that I bought late last year, it was a pre-release product and truth be told, I completely forgot about it with all the excitment of Christmas and New Year - not to mention the influx of new things that I was given as gifts. My mind was jogged when I received another tube in the post from the lovely PR team at Elemis and I've been using it ever since, wondering how I could ever forget the wonderful Elemis products that I had bought (shame on me)! I'm an avid user of hand cream, not least because of the psoriasis on my fingers, but also because I know that neglected hands can be a tell tale sign of your real age as time goes on, and when you go to any length to delay the ageing process on your face (even if this is only by using moisturisers), you don't want all your hard work and dedication being undone because you forgot to include your hands in your reigime. I've said this before, but Madonna is a prime example of aged hands ruining her otherwise, fairly youthful appearance! This cream is lovely! It is fairly quickly absorbed (always handy when you need to use your hands soon after application), although it does leave a bit of a film on - not a greasy one, it's actually hard to describe as this feels unlike any handcream that I can remember using. I keep thinking it reminds me a bit of damp talc, but it's not that either. The bumf on the packaging says that the cream 'forms a silky barrier that locks in moisture' - so I expect this is what the film actually is. My skin does feel lovely and soft after using it so it's not a bad thing at all, and you can certainly carry on with whatever you're doing without issue, or worry that it will transfer onto everything you touch. The cream is described as being 'fragranced with exquisite white flowers' but my nose picks up a rose-y scent when first applied. Now I don't normally like rose scented... anything, actually but this is quite nice, and certainly not offensive to me. Maybe my nose is just picking up on a general floral scent and associating it with rose? I have no clue. Anyway, after a short while it settles down to a much more subtle, sweet floral scent that I adore... lots of hand sniffing ensues at this point. I tend to apply this about 2-6 times a day, depending on what I've been doing and if I've been out (as the cold makes my hands feel very dry) and this seems to be fine for my hands, even with the dryness of having psoriasis. I'm not sure I've been using it long enough to see any difference in the anti-ageing side of things, but I'm quite confident with Elemis products generally, so I have no reason to doubt that it will be doing me some good on that score too. The only downside I've found with this is that the screw top lid isn't as convenient as I'd like it to be. I'd have preferred a flip lid, or something similar as it's never fun trying to put the lid back on when you've either got freshly creamed hands, or if you've just squeezed the cream out and don't want it to drop/go on the tube etc etc.. it's really just a niggle though. The cream is released for general sale sometime this month (maybe already) and will cost £22 for 100ml, which is quite pricey for a hand cream, but I'd certainly have no issue in paying this for this again, now I've used it. A little information on a fantastic offer from Elemis and QVC! Plus you get a navy patent wash bag to keep it all in... so that's £147.80 worth of product for just under £50, including postage. This effectively works out at about a tenner per product, which is amazing value. Not a bad deal, eh!? You could even buy the set and divide it up for gifts throughout the year (birthdays, or even save it until Christmas, which seems aaaaages away right now, but I'm betting it's hurtling towards us quicker than you think) if you didn't want all the products for yourself!